I love nutshells… and when it comes to Advanced Segments, it’s easy to put into one. Let’s say you want to look at only the site visitors that are coming from San Antonio, Texas, or Los Angeles, CA. Not only that, but you only want the visitors that are coming from Facebook. You can advance segment that! No Joke! Creating a new segment in the revised google analytics interface can be a little tricky, they update it quite a bit and it always seems in flux but overall they’ve always mad improvements. 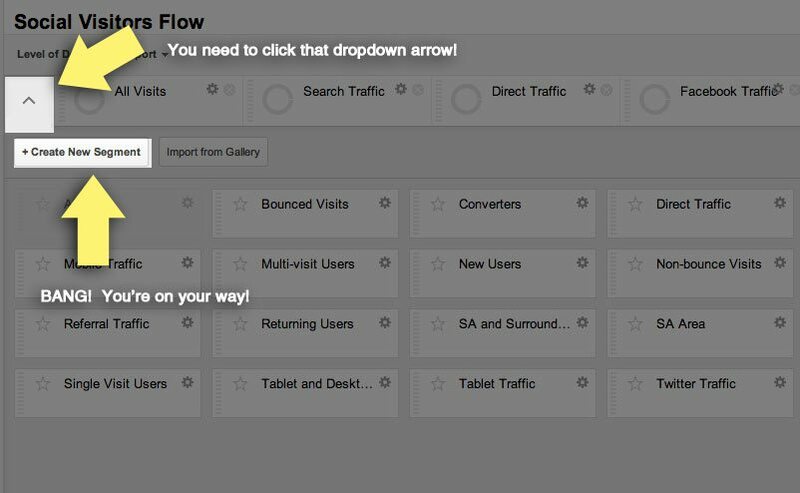 Here’s a screen shot that shows you where the option to create a new segment in the google analytics interface is. Kinda hidden. It’s always good to give the Google Support Docs on Advanced Segments a look also. Usually it’s the most valuable resource.